One of the oldest cities in the Baltic region, Tartu boasts heaps of cultural attractions, a quaint Old Town, and bustling main square. The University of Tartu can claim to be Estonia's Harvard and the impact of this influential center of learning is felt across the city. Students make up nearly one-fifth of the population here, invigorating this ancient town with their presence. They are also largely responsible for the wide array of restaurants, cafes, and nightlife destinations in a small metropolis. A picturesque riverfront, assortment of grand 18th-century buildings, pleasant parks, and diverse museums provide plenty of fun ways to fill your itinerary. Leave yourself plenty of time to sample some of the area's local beers. Tartu is in Tartu County. 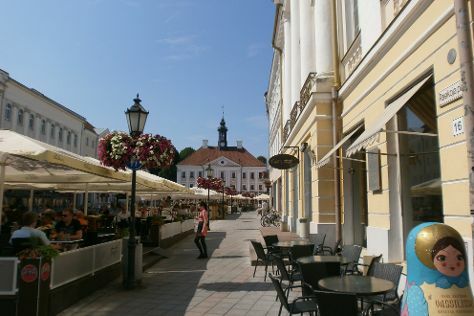 To arrange what you want to do in Tartu, use our Estonia online vacation maker . As a university town, Tartu can get rowdy in the evenings. To ensure a quiet night's stay, look for more economical lodging outside of the center. That said, if you want to be in the thick of the nightlife, the center itself has quite a few budget accommodations catering to the youthful population. Unfortunately, this also means that those looking for luxury hotels in this area may be more hard-pressed. The most populous neighborhood in the city is Annelinn, bordering the Emajogi River, where you will find a variety of accommodations. Alternatively, Kesklinn, a smaller quarter, has plenty of mid-range hotels and budget guesthouses.